A new conference at Spurgeons College in September will being together missionaries and pastors sent to the UK from abroad, to discuss how they can work effectively with indigenous Christians in the UK. The fact that missionaries sent to this country will be meeting here is representative, say organisers, of the fact that we are living in what Philip Jenkins in his landmark book The Next Christendom: the coming of global Christianity, maintains is a transforming moment in the history of worldwide religion. Conference speaker Rev Dr Roger Standing, the Principal of Spurgeon’s College, has no doubt that this analysis is correct, commenting, "The question is, are we open to the Holy Spirit doing a new thing among us, allowing the gospel to shape our future rather than our cultural past?" This ‘new thing’ can all too often be hindered by cultural difference and misunderstanding, and identifying and overcoming such challenges is one of the things the Partnership in Mission Conference seeks to address head-on. "Unity within the Church of Jesus is something very important," says Yemi Adedeji, the Director of One People Commission, a body of the Evangelical Alliance made up of key national church leaders, committed to celebrating ethnicity, while promoting unity within the UK evangelical Church. 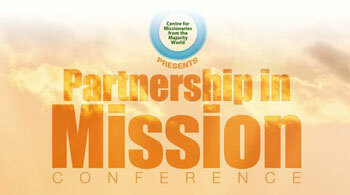 Yemi will also be speaking at the Partnership in Mission conference and he observes that, "[it] provides a welcome opportunity to engage honestly with issues that can divide us, and talk about practical ways that Christians in the UK from all backgrounds can work together to see his kingdom grow." The ground-breaking conference is the brain-child of Israel Olofinjana (pictured above), who himself came to UK from Nigeria and is now the pastor of Woolwich Central Baptist Church. As such, he has invaluable first-hand experience of the tensions and conflicts that can need to be overcome in order for those from without and those from within the UK to work as one. "Partnership can be used to mean all sorts of things but the kind of partnership we want to explore at the conference is one that levels the plain field for all participants in God 's mission in the UK. In essence, a partnership that is not colonial or arrogant, but seeking the heart of God." This is an issue that is very important for Israel. In his challenging and original book Turning the Tables on Mission: Stories of Christians from the Global South in the UK, he chronicled the varied and often difficult experiences of men and women who have felt called to come to the UK from the majority world in order to see God’s kingdom grow. He is also a director of the Centre for Missionaries from the Majority World, an initiative designed to train and equip pastors and missionaries from the Global South as they seek to minister in the UK. Although the conference is aimed primarily at those who have come to the UK from abroad, it is hoped that indigenous British mission practitioners and church leaders will also attend, meaning active contributions are heard from all sides. Confirmed speakers: Rev Dr Roger Standing, principal of Spurgeon’s College, Rev Yemi Adedeji, Director of One People Commission of the Evangelical Alliance and Rev Celia Apaeagyei-Collins, founder of the Rehoboth Foundation.